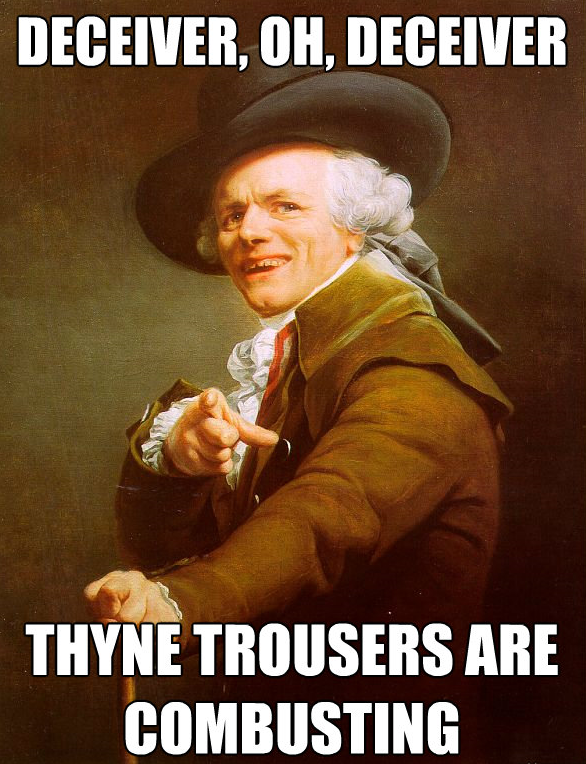 Whether or not you know the word ‘meme,’ you’ve probably seen them before. So what are memes, really? If you want the long, technical version, check out Wikipedia’s entry for Internet meme. To paraphrase, a ‘meme’ in the sense that I’m using it is (very) loosely defined as any phenomenon that is propagated via the Internet. Specifically, I’m referring to captioned image memes, like the examples above (though memes can take many forms). They’re basically fixed images that are given captions based on a specific theme. The theme is pretty clear with this meme. 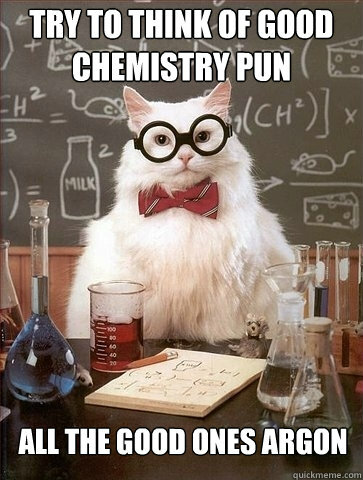 The caption provides a science related pun – the setup is at the top; the punchline at the bottom. 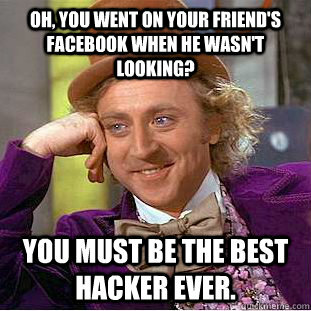 There’s an entire website devoted to this particular meme (NOTE: some may be inappropriate). If you’re unsure, the theme behind this meme is to take modern song lyrics (in this case, the Baja Men’s “Who let the dogs out?”) and restate the lyrics in “archaic” or elevated language. The story behind this meme is actually pretty interesting. The artist, a real 18th century French painter, liked to take creative liberties with the standard portrait format of the time. Two hundred years later, someone discovered this painting, decided that the artist looked like a Baroque-era interpretation of Biggie Smalls and added an altered line from a rap song as a caption. The picture was posted on image boards and spread. This is the chorus from Chamillionaire’s “Ridin'” (“They see me rollin’ / They hatin'”). These memes are meant to provide a funny one-liner. That’s really it. But for your students, they can function as critical thought exercises, both in deciphering their meanings and in creating new meanings within these thematic constructs. The “Archaic Rap” meme is especially valuable in the the English classroom. It provides opportunities to discuss code switching, context clues, unfamiliar grammatical structures (like passive sentences), and synonyms/antonyms. It’s also a great vocabulary builder. And since your students are probably already familiar with it, you’ve got instant engagement in the lesson. I’ve put together a few examples that I think are appropriate and relevant. Quiz your kids on them, and see if they can figure out what the original line was. While discussing each example, ask your students what context clues helped them figure out each lyric. Keep a list of unknown words to define later. Or, go through and make a list of difficult vocabulary words, including the archaic pronouns and lesser-used words (thy, thine, thou, hither, yon, perchance, etc) and have the students define each word first. Then, use the definitions as a key to deciphering each example. Model a new one. Take a lyric from a popular song and discuss the ways it could be altered to fit the meme. There’s no one way to do this, and the examples can range from simple synonym substitution to complex transformations of the words. Have your students create their own by taking the original painting, dropping it into MS Paint or PowerPoint, and adding their own captions. I’m not helping you with this one. There are literally a dozen or so ways of wording this – and that’s what your students should take away from this: a new understanding of how we can arrange different words to convey similar meanings. 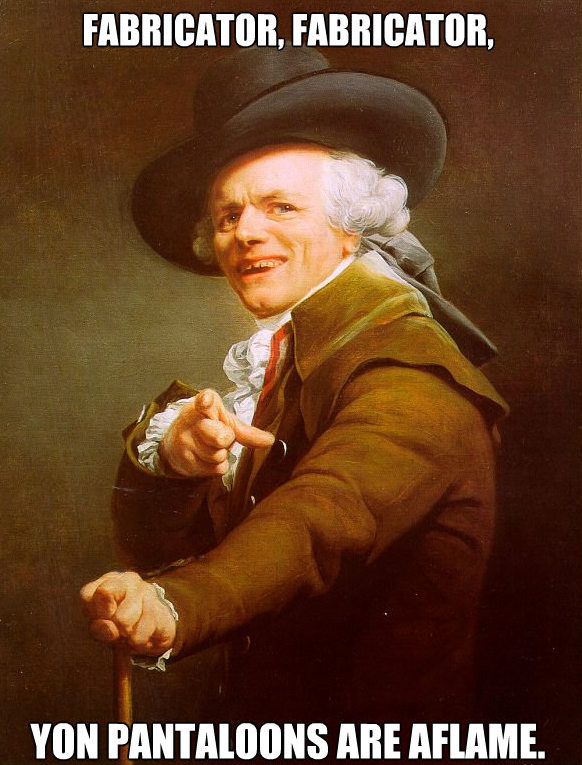 How cool would it be to rewrite all the class rules with this meme (“Thou shalt extend thine arm skyward whilst attempting to make an inquiry.” “No pupil shall allow appendages to wander beyond the confines of his or her designated writing area.”), and then put the posters on the wall? I personally like walking that fine line on the outer edge of “school appropriate” because I think that’s where you’ll find most of your students are engaged. With that in mind, while (I think) the examples of the meme posted here are pretty harmless and school appropriate, many of the ones you’ll find through a search engine are not! Don’t let your students go looking around the Internet for these. Seriously. Take the idea and run with it, but don’t do anything that’ll merit a parent conference. I hope you get some sort of use out of this, because I think it’s a pretty cool exercise. If you missed them in the post, here is the link to the original painting (for making your own), and here is the link to a list of my “school appropriate” choice (My opinion only – use your own good judgment). This entry was posted in Fun Stuff, Lessons, Technology, Tips and Resources and tagged critical thinking, education, English, lesson plans, memes, teaching. Bookmark the permalink. Hi there . These ideas are so great! Just wondering how they could be adapted to teaching History (specifically WW2)? Any ideas? Hey! I know this was posted months ago, but it got lost in all the spam comments I get. Sorry! Sure, some of these memes could be adapted for history lessons. All you need to do is take the intent of the meme and find a way to tailor it to important events or people. Just be careful that you’re not doing anything in bad taste. Memes are used to make light of situations or to poke fun at them, so I wouldn’t suggest creating memes directly related to the Holocaust or use of the atomic bomb, but there are some topics that wouldn’t be as taboo. Or use the “Challenge Accepted” meme to comment on the women who worked in factories and shipyards during WW2 “against” traditional gender roles. You could superimpose the phrase on the classic “We can do it” poster or photographs of women working in factories.